Brushes are an important tool for the watercolor artist. They may be crafted from natural, synthetic, or boar hair. Natural hair, such as sable, is the most expensive; Kolinsky sable is especially valuable. Other natural hairs are goat, mongoose, squirrel, and camel. These natural hair brushes return to their original shape after washing. Synthetic, or man-made, hair brushes may work very similarly to natural hair brushes but they cost much less. Other brushes are blended from nylon for durability with natural hair for holding capacity. Watercolor brushes are generally chosen for the type of job they will do. Most common are flats and rounds. Flat brushes will hold a lot of water or paint; therefore, they're good for painting wet washes. Round brushes also hold fluid well. Various brush shapes make it easier to create fine lines, special effects, or rounded or square shapes. 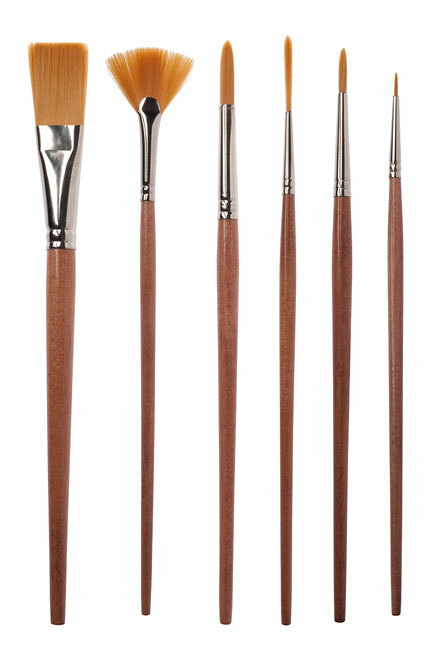 Most brush shapes are available in varied sizes for overall background or fine detail painting. Other brush shapes are called fans, mops, liners, shaders, brights, and filberts. There are even some shapes that produce unusual designs. A watercolor brush is crafted by hand with a brush head, roots, a ferrule, and a handle. The brush head holds the paint and carries it from the palette to the paper. Ferrules hold the hairs of the brush in place. A brush should have a secure ferrule. A balanced wood handle should be painted and varnished. Never stand brushes on their heads in water for any length of time. The wood handle can expand and ruin the brush. Brushes should be washed with mild soap and rinsed thoroughly. Before drying, form flat brushes to a square and round brushes to a point. Transport them in a divided brush holder or lay them out separately and roll them up in a place mat or brush holder. Canadian distributor of art supplies. Robert Simmons brushes are available in North America only. Quality art supplies. Daniel Smith watercolors and brushes. Also printmaking supplies-water-soluable inks. Producing brushes for fine art since 1933. FM Brush is America's premiere manufacturer of artist, cosmetic, surgical, ceramic, craft and custom made brushes that are distributed globally. Manufacture Raphael and Isabey brushes. Winsor and Newton is a leading brand of watercolor paints. Founded in 1832, Winsor and Newton produces quality art materials.